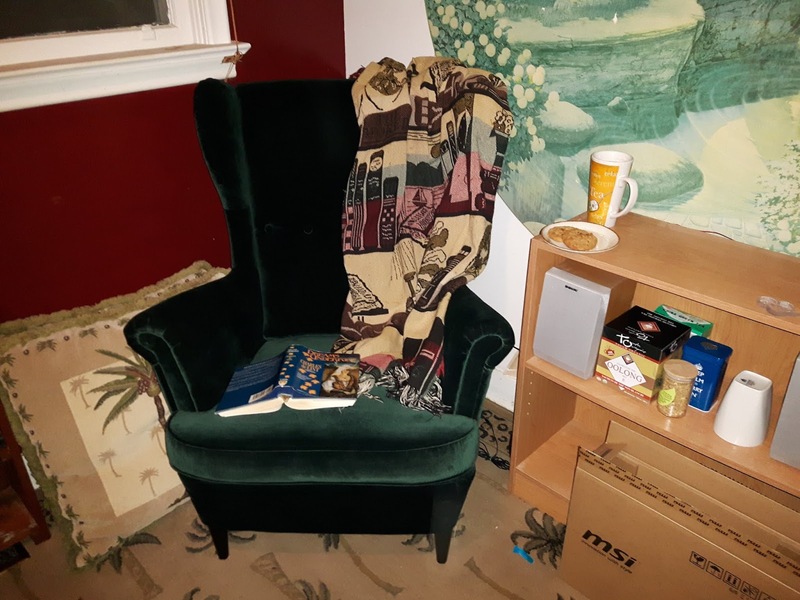 First of all, just to get it out of the way, a few weeks ago I posted the saga of trying to find a reading chair for my office and I promised to post a picture. It turned out not to be the chair I had intended to buy, it’s a much fancier chair and one that will be great for sitting in both to read and to edit. And now that I have my chair to sit in for editing, I need something to edit. If I’ve gotten off track with the writing this year, then the last couple of weeks have opened up a chasm where the track stops short. Time to find a new train to board. I started thinking about this late on Sunday afternoon while I was trying to finish an email to my best bud. Emails and blog posts being the exception, I haven’t been writing much this year. Oh, I’ve made notes and plans and even the odd prompt story or poem, and I at least made attempts at my in-class assignments, but I have written pretty much next to nothing on my big WIP, the novel that should have been ready for release at Christmas. I’ve been taking my writing bag with me when I go to babysit, but I don’t get much writing done. Truthfully, lately by the time the grandbaby goes down for a nap I’m ready to nap too. Either that or I end up continuing to read the book I bring to read while I’m eating lunch. I work better with a goal. So my goal this week is to spend one hour in the morning working on my novel, preferably in my office, and work on shorter stuff – poems, short stories, editing – during nap time when I’m babysitting. I’ll start bringing my tablet instead of a novel and start listening to the Dean Wesley Smith series on originality during lunch. And when I’m finished that series there’s a bunch of other videos and pod casts he’s made too. I want to write next Monday’s post and be able to include my wordage report like I used to. And on Friday I want to post new words, not regurgitated words. That being said, it’s easy to feel all fired up with ambition when I’m typing this on Sunday night, barely able to keep my eyes open. But the light of day will be the true test, with all its distractions illuminating my weak will. Can she do it? I guess only time will tell.